Well, another artist that we’ve seen live has died. It pains us to report that soul singer Amy Winehouse was found dead in her London home yesterday. And when I heard the news yesterday I thought back to when we saw her perform in Lollapalooza 2007. We only watched her perform a few tracks during the trainwreck of a set. And it was sad to see her attempt to play a show in Serbia earlier this summer as part of her comeback, but was booed off the stage. The first thing that came to mind was Coheed and Cambria bassist Mike Todd who was arrested for trying to rob a Walgreens Pharmacy for Oxycontin. Many artists are known to use drugs and alochol to cope with stage anxiety. And in previous interviews, Winehouse was noted as saying when she took drugs and drank before a show, it actually helped her perform better. And that topic is something were going to take a deeper look at on a future episode of Live Fix Radio to see if it is truth or just an addiction-fueled myth. The next thing I’ve thought about is how Winehouse has now unfortunately joined the 27 Club, an infamous group of artists — Jimi Hendrix, Kurt Cobain, Janis Joplin, Brian Jones — who’ve all died at the age of 27. And as I look at that group I’m reminded how all those artists were great live performers in their own right. And I’m sure they all dealt with their own stage anxieties with drugs or they were able to translate and channel their anxieties into a compelling live show. And when I think about Winehouse’s short career and the shows she played, I wonder what went through her mind and heart as she performed live. Did she ever have a show where she truly saw and fully felt her fans enjoy the music in front of her, like Enimem now does since he’s been sober? The last thing I’ve been thinking about is our ongoing experiments with concert fan emotions, how women experience live music and our tribute to artists and fans who have died and passed on to the big concert venue in the sky. There’s a lot to learn from stories like these and I invite to check out those posts and share your thoughts too. 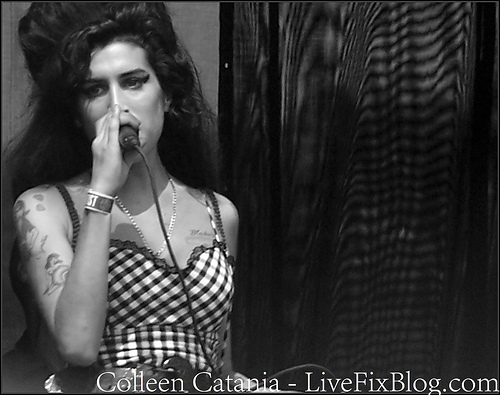 Did you ever see Amy Winehouse perform live? Have you ever wondered about how addiction impacts the live music experience? We invite you to share your thoughts and concert experiences in the comments below, so they can be included in a future episode of Live Fix Radio. Concert Review: Was Pitchfork Music Festival 2011 A Success?